This post presents a Java FX program that uses overlays to notify the user of a validation error. The solution is FXML-driven and uses an off-the-shelf Scene Builder Alert Template with no modifications. Ever since the early days of the web, I've hated popups. Even when they're needed -- say to let you know a validation has failed -- they can inconveniently position themselves far from your mouse's location. Worse still, you might have to shuffle your windows looking for a popup with a bad z-order. The function of the demo application, called Maven POM Updater, is to recursively update the versions of Maven POMs in a directory structure. This application consists of a main screen with some controls (TextField, TableView, Button). If the user attempts an operation without sufficient parameters -- say scanning a folder structure that isn't found or doesn't have any POMs, the user is notified. The notification mechanism is to overlay a modal component on top of the main view, allowing for the main view to be seen via transparency. If you're coding Java FX, it's important to incorporate FXML into your design to support a flexible UI. Although GUI builders have been around for years, the technology has advanced to the point where it can be incorporated easily into a project's mainline Java development. See Apple's Storyboard for a GUI builder success story. Also, you can support different UI requirements. For example, I have a Hi-DPI set of FXML for this particular app. The Main View was created based on a mockup while the Alert View was created with the New > Template command in Scene Builder. Additionally, it's important to use CSS to benefit from the productivity boost in focusing on styles and also to support skinning. Customers may want a less flashy, more readable, or co-branded version of your app. I'm using CSS to set several backgrounds. .alert-background-pane has the dark gray with a slight alpha to show a dimmed mainView when the notification is displayed. The Java Code starts with the Application subclass. In the start() method, first load each FMXL file using the FXMLLoader class. Unpack each Controller so that you can connect the MainViewController to the AlertViewController so that the business logic of MainViewController can configure the alert based on the validation or other condition. See "mainViewController.alertController=alertController". Note the StackPane which is the display organizer for the app. mainView will be loaded directly into the StackPane as the second of two items so that it appears on top initially. alertView will be wrapped into a FlowPane to allow for the centering. The FlowPane containing alertView will be added to the StackPane as the first items, initially in the background. These lines are additional CSS wiring and Scene creation. 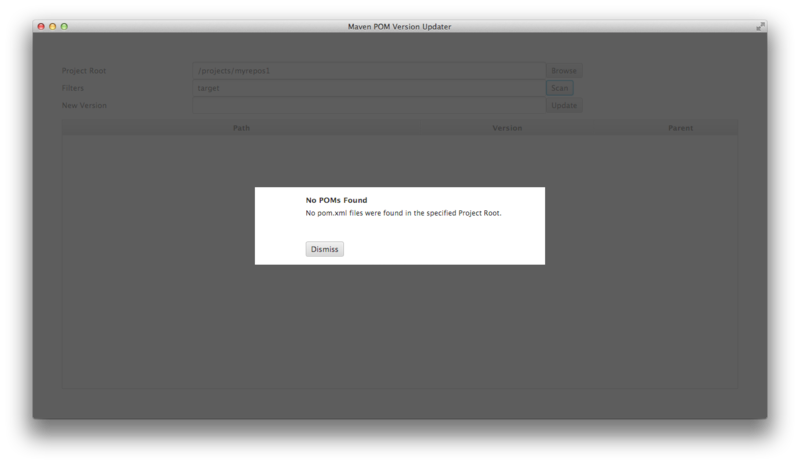 The Browse button will produce a search path for Maven POMs. If you press "Scan" on a path without any POMs, you'll get a notification. In terms of the UI, mainView will be put to the background of the StackPane. This presents alertView and dismissing this will put alertView in the background. There is a handy "toBack()" call that makes this happen without manipulating the underlying collections. 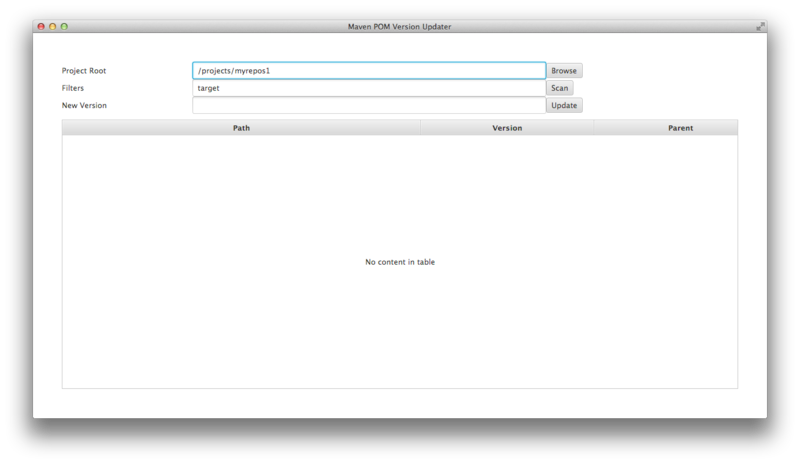 mavenpomupdater.fxml is a VBox which is injected into the mainView Controller. In a method called "scan()" which is wired to the Scan Button, there is a block of code which checks for pom.xml files. If an empty list is returned, a method on the AlertViewController is called (from the MainViewController). setNotificationDialog() sets the specific message that the user will see. This is followed up with a toBack() call which puts the mainView in the background. The alertView exists for the life of the app, but the message and details change. Note that the fx:ids that I'm using are the ones from the template without modification (cancelButton, messageLabel, etc). To dismiss the app, I use the injected GridPane (from the FXML) to get the parent (a FlowPane created in the code). I then call toBack() and mainView retakes control. The Escape key can also dismiss the notification. Back in the start() method of the Application, there is a listener registered that makes use of alertView. What I like most about this solution is that there is a real minimum of Java code in the app devoted to the UI. I don't have to keep track of what the user's seeing. This is a small app, and if there were more views, I'd consider replacing the toBack() algorithm with a toFront(). However, that means that something has to keep track of what is being toFront()-ed. I'll be putting the full source up on a public repository on GitHub. If you'd like to see the app in action, visit http://www.bekwam.com/mpu and pull up the mpu.jnlp (this is a Beta version that works as-is). Note that only Java 8 is supported, so if you're working from a Java 7 machine, wait for the source and run it locally. If you have any suggestions for the app, email them to mavenpomupdater@bekwam.com. great tutorial. it would be great if you could provide the java project... otherwise it's hard to understand all the parts as javafx beginner. Several of these posts are paired with a Maven module stored in GitHub. The links to the projects are in the posts themselves. I'll be adding a link on the learn.html page on my main website. This is the GitHub parent project: https://github.com/bekwam/examples-javafx-repos1.